RealSoft is a complete VAT Compliant ERP Software for the small and medium-size companies in Dubai, Abu Dhabi, Ajman, Fujairah, Sharjah, UAE. ERP Software automates and integrates all divisions of business and facilitate its smooth functioning. That’s where we come in. The role-tailored experience of Realsoft ERP gives your people access to information. The right information. And, when your people get their hands on data specific to their day-to-day jobs they get started quickly, become more productive and more efficient even faster than before. This is a powerful feature to automate your complete operation. Workflow definition ensures “the right work is brought in the right sequence at the right time to the right people.” It is a tool designed to facilitate and automate business processes that require tasks to be performed by people. Workflow allows process owners to keep an eye on deadlines, provides statistics on the length of time to complete work processes, determine the workload with regard to individual employees and save processing time. Purchase & Inventory : To keep your retail business running smoothly, you need a cost effective inventory management system. Coral solutions can help you improve inventory management processes. CoralInventory is an extended inventory module for all kinds of industries like general trading, drugs and pharmaceuticals, automotives, etc. Material Procurement : Coral Procurement allows organizations to integrate supply activities across enterprise functions and helps procurement become a business-critical activity. Coral Procurement enables organizations in engaging key users and suppliers to leverage for better spend compliance. It delivers significant cost savings by improving order processing efficiencies and contract compliance. Estimation / BOQ / Budget Entry : It facilitate to enter detailed estimation and variations (both quantities and amounts) of the project.It allows different stages of quantity and cost break down as Project,Stages,Substages & Cost Unit. This is helpful in comparing and controlling job cost. Option of having revised and targeted budget. Option of lump sum value for some items where quantity measurement is not possible. Job Costing : Job costing is the process of tracking the expenses incurred on a job against the revenue produced by that job. Job costing will generally applicable for the industries like building contractors, subcontractors, architects, consultants, etc. The Job costing reports in the Coral solutions helps you ensure that all costs involved in a job have been properly invoiced to the customer. An Estimates vs. Actuals report compares quoted costs to actual costs, and quoted revenues to actual revenues so that you can analyze any variances between your quote and the actual result. Man Power Cost : Labours will be working on different projects in the same month. Specially designed time sheet to track labour cost project wise, stages and sub stages wise. This will generate automatic payroll for the labours. Sub Contractor Cost : Tracked from the sub contractors module. Human Resource : Coral Human Resources Management (CHRM) module is a complete suite of Human Resource Management system. It takes care of entire human resource cycle right from recruitment to retirement. It handles enterprise-wide core human resource activities such as recruitment management, employee management, training, attendance & payroll, leaves, tours & travel management, performance evaluation, and loans and advance management. Time Sheet & Payroll : Payroll module generates quick employee(Staff in projects and Office staff)pay sheet & Payslip. Daily data consists of employee wise, project wise, stages wise and sub stages wise normal working hours,normal overtime hours,special over time hours. Employee can work in same day for any numbersn of projects ,stages and Sub stages. Miscellaneous Cost Job Revenue / Sales : Tracked from purchases and Payments module. Coral Sales & Distribution provides end-to-end automation of an organization’s sales cycle which comprises quotation processing, order processing to invoicing and delivery with multiple pricing methods, payment terms and delivery schedules. It does support multiple units of measurements and currencies. The module is developed with various level of access control and the best part of it is that the reports can be seen by management or concerned person from anywhere, anytime. Coral Sales & Distribution allows the enterprise to connect between the remote locations through Smart Linking. Job Revenue : This will facilitate to make invoices based on the percentage of work done in various stages and Substages of a project. This will take care of variations, retention receivables,advance deductions etc. Related accounting will be done automatically. Cost Control & Alerts : RealSoft ERP Software helps in controlling the project cost.When ever you want to commit a cost on the project system will compare it with targeted budgeted figures (both quantity and cost) and gives you the alert. This facility will throw the light on the performance of estimator and wastage at work. This will show in which stages and sub stages you made a profit or loss. This statistical data will help the estimators to prepare a better future tenders. There are many alerts in the system like budget exceeding,Payable reminders,PDC alerts, receivable alerts, alerts to the MD if LPO approval is pending. Security and Administration : Multi level security and access permissions View,Add,edit and delete permissions New user creation (Login & Password) Data Backup & Recovery Audit Trail. Smart Linking : Smart linking is a tool to synchronise databases between multiple remote instances of Coral applications.This tool will allow the users to work locally and to update the entries to desired location after that. This is an effective way of connectivity between locations because users can attain more speed and accuracy. Moreover all the locations will have the same feeling that they are working in the same office. CRM is a business process in which client relationship, Customer Loyalty and Brand Value are built through marketing strategies and activities. Coral CRM Software allows the business to develop long term relationship with established and new customers while helping stream line corporate performance. Coral CRM Software is a business software for Dubai that helps in identifying, understanding and providing better service for your customers while building a relationship with each customer to improve customer satisfaction and maximise profits. Coral CRM Software acts as a powerful tool for managers to take quick business decisions. Coral CRM Software is for your complete sales automation by adding sales persons, agents, prospect customers, recording customer enquiries with all details, enquiry matching search, enquiry source and mode, assigning enquiries to sales people, enquiry follow up and its history, enquiry follow up reminder alerts, enquiry listing, enquiry status, hot enquiries, Sales people appointments tracking, due date alerts, auto call notice, auto reminder notice, sales analysis etc. 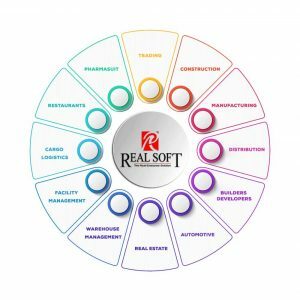 RealSoft Trading® — The Complete Trading ERP software, a leading edge trading solutions and scheduling programs for the global trading industry in Dubai, UAE. Our innovative software empowers trading companies with ground-breaking scheduling program and document management system that maximizes the productivity and saves time. Our Software dashboard scheduling system is an innovative program and our resource planning package replaces whiteboards and multiple spreadsheets with electronic whiteboards. RealSoft Trading ERP Software enables users to take appropriate decisions for the operations quickly and hassle free.RealSoft Trading is a powerful industry vertical which is applicable for all kind of trading and service providing companies. Realsoft’s use of innovative technology allows us to build a suitable solution that combine ease of use with a robust tracking and scheduling tools that can meet the demands of any commercial trading firm and can be incorporated into varied type of companies. Coral RealSuit — The complete Real Estate ERP Software from Coral integrates intuitive management with complete accounting functions, making it a comprehensive solution for managing all types of real estate in Dubai, UAE. Coral Real Estate ERP Software is ideal for everyone from local and regional property managers, principal investors to third party managers, property buyers/sellers, property rental agencies and real estate organizations. Its scalability feature makes it flexible and adaptable to your constantly changing businesses requirements. Real Estate ERP Software gives you greater insight into your real estate portfolio and hence better control over your real estate investments. Managing your accounting is also a lot easier as our Real estate ERP software is completely integrated with your back office. Our property management software is really an end to end solution with features that’ll come in handy at every stage of the real estate lifecycle. Coral Lite, the Financial Accounting Software from Coral is a powerful yet flexible account management tool that helps manage an organisation’s inventory and invoicing details. Its advanced inventory control module enables users to get full access and control to all accounting data for the entire organization. Apart from basic accounting software features like maintaining company records for product analysis and providing password protected authentication to prevent unauthorized access, Coral’s accounting software has many advanced features as well. Our accounting software will not only support basic functions but will also allow you to improve inventory levels, automate billing process and analyse sales/purchase data to improve relationship with customers. With the Coral Lite accounting software, you can manage Billing records, Inventory details, Tax records, Voucher entries, Sales and Purchase order records, customer-vendor records and similar financial records all at one place. Our software precisely calculates the general ledgers including Balance sheets, Trial balance, Financial Bills and Profit/Loss details in a few steps. Coral Lite is an end to end accounting application that is extremely reliable and easy to use. It can be learned easily and will also liberate you from tedious and time consuming paper-pen financial tasks. Coral lite is ideal for mid – sized companies dealing with inventory, warehousing, job costing, pharmacies, general trading or contracting. Affordable, intuitive, easy to use and robust, Coral Lite has become the preferred accounting software for several medium sized companies in UAE. Coral Lite is extremely scalable as well and can easily adapt to meet your growing business needs. RealSoft Manufacturing Software is a powerful application to manage the entire manufacturing process of a company. This module provides various procedures to automate a production plant and enable an efficient control over the entire process. RealSoft Manufacturing is a powerful tool which helps you to to easily ascertain the cost at various stages of the production. RealSoft Manufacturing Software module provides the flexibility to customize the formulas and procedures of the production strategy of a company. Our Manufacturing ERP Software is a ready to use solution, which can be customized to meet the individual requirements of manufacturing facilities. Extended Dash Board makes Coral Solutions live and informative. Dash Board contain alerts, triggers, user messages, and KPIs, metrics, charts, trends and data visualizations. Drilling down from dash board gives you quick access to the data. The functionality of this Dashboard can again be customized as per the users’ roles & preferences. Inventory Management Software from Realsoft makes dealing with inventory management for all businesses easy. Whether you are looking for inventory management for commercial or non-commercial industries like Clothing, Electronics, Aeronautical, Mechanical, Medical, Hotel, Retail stores, Online Shopping Malls or Home Business, Realsoft Stock, our inventory management software, will help you for speed processes. Realsoft Stock simply and rapidly handles invoicing, stock management and many more key functions along with maintaining customer details in an interactive and user friendly interface. Coral Stock enables you to track stock balance, sales, customer order records, invoice, price data, backup stock, order processing, purchase orders, pay orders etc by significantly reducing paper work. Coral Stock offers a broad and innovative inventory management solution that helps synchronize items, stocks, productivity of different stores and helps to ensure sufficient supplies. Our Inventory Software maintains track records of sales, purchase and vendor prices of all the goods stocked in the system. Some of the salient features of our inventory tracking software includes Barcode reading for price identification, multi-currency adoption according to identified rates, fast and precise report generation, expiration alert for items, Multi-user compatibility, Security with permissions and many more. Coral Stock provides a comprehensive set of manufacturing, and purchasing capabilities for integrated supply chain management and control. This software helps you gain detailed, real-time insights into key supplier, inventory and procurement indicators. Realsoft Stock will also help you improve collaboration throughout the entire supply chain by giving self-service capabilities to partners, vendors and customers, thereby allowing you to share supply and demand information easily. Coral Stock helps the business to attain new opportunities by keeping a real time track of Inventory, reduce time to maintain them thus making your Sales & Purchase Management more efficient. Coral Stock allows the enterprise to connect between the remote locations through CBS exclusive database linking tool – Smartlinking. You can keep your database management centrally from the server and Smart Linking will synchronise the data with branches automatically and thereby enhance Productivity and Accuracy. Increase product margins by effectively managing pricing based on different types of customers, channels and currencies. Gain control over inventory replenishment and ensure that you have enough on hand to fill anticipated orders, while keeping excess stock to a minimum. RealSoft Contracting software provides leading edge contracting solutions and scheduling programs for the global construction industry. Our innovatory software empowers construction companies with ground-breaking scheduling program and project management system that maximizes productivity and saves time. Real Soft Contracting ERP software is a powerful application for construction business and the application is equipped to manage Project management and Cost control for the project execution with its key modules within the scheduled estimate. It also enables the company to manage the operations more organized with efficient methods.